Dominated by Narragansett Bay, Rhode Island's scenic coast is paralleled by the tracks of some of the oldest and now fastest railroads in the United States. With determination and ingenuity, early civil engineers overcame barriers such as the Great Swamp, which stretches from Kingston to Westerly. 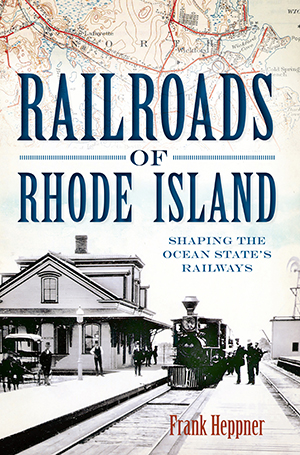 The state's key position at the intersection of trade routes and between the major population centers of New England also shaped the placement of its railroads, as well as their dynamic character. Tour the state's historic railways with longtime railfan and railroad historian Frank Heppner. From the Stonington Line to the Boston and Providence Railroad, speed along the pioneer tracks in Rhode Island. Frank Heppner was born to a railroad family. His father was a doctor for the Southern Pacific Railroad in San Francisco, he had his first train ride when he was three and he made his first scratch-built HO railroad car when he was thirteen (he still has it). He's ridden over 500,000 miles by rail in twenty-three different countries. As a graduate student, he talked his way into cab rides on the Shasta Daylight in California and the Super Chief through Raton Pass. Between train rides, he picked up a PhD in zoology from the University of California at Davis and taught first-year biology to over twenty-five thousand students at the University of Rhode Island. He retired from this “day job” in 2010 after writing more than sixty scientific papers. He was a founding member of the Friends of the Kingston Station and is today its chairman. He is also active in the Rhode Island Association of Railroad Passengers and is a member of the Little Rhody Division of the National Model Railroad Association.